About a month ago, I asked a friend of mine what brand of shoe I should get for conferences. I travel to 3-4 conferences a year and have to be on my feet for 2-3 days straight. My shoe choices were killing me. She recommended Tieks. As soon as she typed the word, all of the ads in my browser began showing beautiful and bright leather ballet flats. I started down the rabbit hole. Tieks are Italian leather ballet flats from a designer named Gavrieli. They are hand made with high quality Italian leather and have a unique sole that allow them to easily fold in half for flexibility and ease of storage/transport. (Learn more here). They're ideal for people who have to walk to work in professional garb, like DC or NYC. Tieks are very popular for people that work on their feet all day, like teachers and those in service industries. You may also see them on the feet of nearly every travel blogger with a healthy Instagram following. Unfortunately, the high price tag keeps this shoe out of many working people's closets. 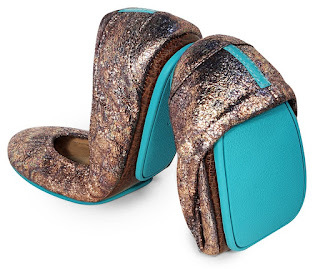 The basic style can cost as high as $175 per pair, with very fancy styles all the way up to $375 per pair. Oprah loves them and celebrities can sometimes be seen wearing them when they're not on the red carpet. 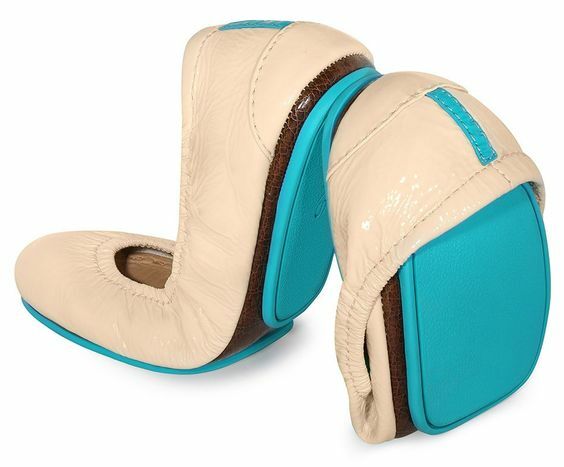 They're only available at Tieks.com and very few brick and mortar retailers, usually just in major cities. These limited channels keep their prices high and the resale market very hot. So naturally, I scoured eBay for a pair in my size that were under $100 - I won a (very) used (and damaged) pair of Biscotti Patents for $53! They had a large slit in the side and scuffs on the edges. 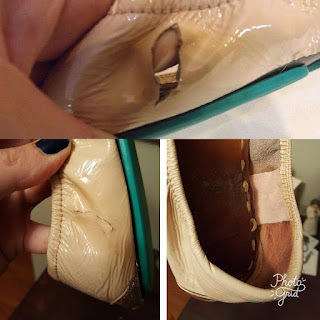 I joined a FB group and asked the hive mind how I could repair these coveted shoes - they told me Dr. Scholl's moleskin and Shoe Goo should do the trick. It did. I fixed them, put them on, and felt richer and better than everyone around me. And then my heel really started hurting. I added more moleskin to the back heel to make it stand up a bit more and that seemed to help. Even though my feet didn't feel like they were covered in soft puppies and walking on rainbows, I already wanted more. I convinced myself I needed a new pair so I could be the shoe's one true foot. I studied the colors and styles, determined my total cost per wear based on my wardrobe, and chose the prettiest color: Lovestruck. 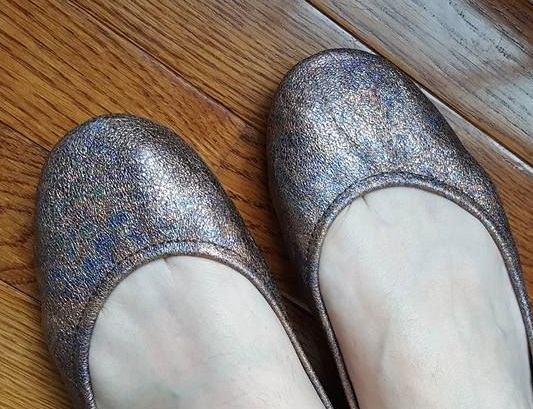 Although it looks like glitter, they are, "crafted from soft, Italian leather that is pressed with a delicate foil, then tumbled to give the leather a crackled, antiqued appearance. The leather is unique in that it has a subtle, iridescent pattern which gives the leather an uncommonly brilliant shine with a unique pattern." So that means they're awesome and better than every other shoe you've ever owned. Having spent hours of my life researching and following FB groups, I knew these beauties would need preparation before going out into the wild. I bought Frye's leather conditioner and Angelus neutral leather acrylic paint. I was ready. I got my coveted Tieks blue box, Frye's conditioner, and Angelus paint all on the same day. It was surely meant to be! I removed the shoes without even taking photos of the unboxing, which is a major Tieks faux paux. I put them on my feet and stood up. They felt exactly like split sole ballet shoes. Again, I wasn't covered in puppies and walking on rainbows, but they felt very nice and fancy. I prepped an area at the kitchen table and started to paint with the Angelus. Then I conditioned with Frye's. THEY WERE SO PRETTY. I decided to do another coat to make sure my precious would remain pretty. Paint. Condition. I added moleskin to the toebox to prevent the dreaded "toe bump." (See this helpful video on how to do it.) Now they were ready for the wild. 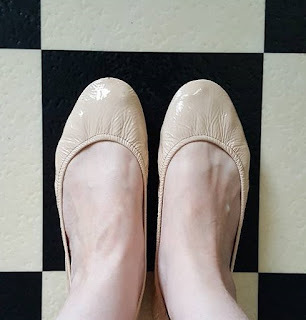 I chose to unveil them on a trip to the salon in a nearby uppity town - surely someone would see how special I was to have owned a pair of elite shoes. No one cared. But I took several shoe selfies (shofies?) in various lighting and posted them to the FB group anyway. There was much rejoicing. After my grey hair disappeared, my shoes took me to my best friend's house for a cookout. And guess what - SHE NOTICED THE SHOES! Validation. They fold in half easily, the style fits my feet well, ships quickly, available in many beautiful colors, and they even come with a tote and small black pouch if you need to shove them into your purse. I also love their customer service. And how they make you feel like you're better than everyone around you. Would you buy another new pair? No. The price point is just too damn high. They feel wonderful, I'm glad I have what I have, but there's no freaking way I can justify getting another pair for the foreseeable future. If I had a job that required more time on my feet, then I would consider getting more pairs. (I can see why teachers love them.) But I can't personally justify spending that much on a pair of shoes when I sit at a desk for a majority of the day. Two pairs is all I need for travel and conferences. Would you buy another used pair? If I can find another pair under $75 in a color I wanted prior to seeing the listing, then maybe. For now, two pairs is just enough. Nice collection of latest shoes, Thanks for reviewing these items. A good and enjoyable bath is incomplete without hot tub cheap in your bathroom.